ARE YOU SEEKING EXCITEMENT OR CONTENTMENT? I have a 5-year Q&A journal that I purchased just after the fire. I did this mainly out of fun. I have a regular journal that I track major stuff in, but this one narrows things down to a simple singular question. This was for today: Are you seeking excitement or contentment? Since this mini book records several years in a row, I found it interesting that the last two years I was excited about things. Things that, to date, really have not come to pass (bummed a bit on that one). However, now I find that I am seeking contentment more than excitement. Too many things, good and bad, have happened over a very short period of time. I have learned, once again, to appreciate all that I do have. I also appreciate the things I can still do. Maybe this has made me mellow as I age (eeek-really hope not)? I prefer to be content with the things I have, the people I share things with, and the way things are in general. I am learning not to be so upset by things I cannot control (we will NOT get into politics in here! ), but working on things that I can control. The hardest issue yet to work on is “time” – it’s still a bugger for me. I used to live by the watch on my wrist, which is pretty sad if you think about it. There was nothing else to let me know what I was doing except that watch and my day timer. No cel phones, no ipads or tablets, not even laptops (they didn’t come out till much later). I remember the first computer I ever used (and fell in love with) was the old punch-card type (for those that do not know what I am talking about: check out these pics!) That and typewriters got me hooked on keyboards, but they did not keep my schedule. I no longer have a watch. The fire took what I did have, and then my cel phone just slowly seemed to sneak in and replace it (my new “monster” inanimate object). I just keep alarms now. They go off with all kinds of different noises when I need to do or be aware of something. Being a writer at heart, I still keep a physical pen-and-ink day timer. I find something comforting in paper and pen things. Then again, it may just be because I am addicted to these things worse than a drug addict (yes, I am positive on this!). I CANNOT walk past a stationary store or section of a store without checking it out. I physically and mentally have to keep telling myself – “Walk on – no you have enough and don’t need another!” I also have issues with the crafting areas. I try to focus on the things that really matter to me now. My family, our critters, and gardens, the farm, and all my personal passions. I have no need for huge social affairs anymore. I prefer a comfortable get-together with a bunch of good friends. I look forward to a moment of peace which is, unfortunately, few and far between. My excitement now is only produced when I complete a crafting project for a family member of loved one. I don’t think this is an age thing. I think it is deeper than that. We hunt all of our lives for peace. We seek out like-minded individuals so we don’t have to be continually on the lookout. I will always look to improve whatever I can for whomever I can but, all-in-all, I am content! I can relate to a lot of what you’re saying here. Maybe with age comes some wisdom whether we’re seeking it or not. That journal is a cool idea. I wonder if there is a digital equivalent. I blog online which spreads my goofy thoughts and ideas around enough I think (maybe?! LOL). But I may look into using one of these some day. Just because I type faster and better than I write (I love to write but I never said I was good – LOL). My wife has started a bullet journal (Google it!) And she finds it great for her. I’m very much a case of “play it by ear” because I’m either very relaxed about things or I don’t care enough about them. If it’s a job that needs doing i will do it now rather than wait or out it off. And I have never been one for excitement… often it means something is going wrong! Ok now I am researching on it – would she be willing to share, if her’s is online, which she prefers and why? There are TONS of them just like regular journals online and free. Tell her Thanx – one more thing for me to put on my to-do list – LMAO!!! No no… Its a pen and paper one. It’s a little like this one from what I remember. Just without all the fluffy stuff. Online journals are great… But DO NOT put sensitive info up there and don’t treat it like it’s imperative that it doesn’t get lost. I like this post. I make little todo lists for what things I want to get done(no, really they are so I don’t forget what I want todo lists). They are mostly for what I need to get accomplished on the computer over a couple days. I have decided to use you as a test subject in a todo I have been wanting to try. I have seen people post photos in comments I wondered how they did it. So I thought about it and came to the conclusion that they copy paste the WordPress URL from their Media Library into the comment. 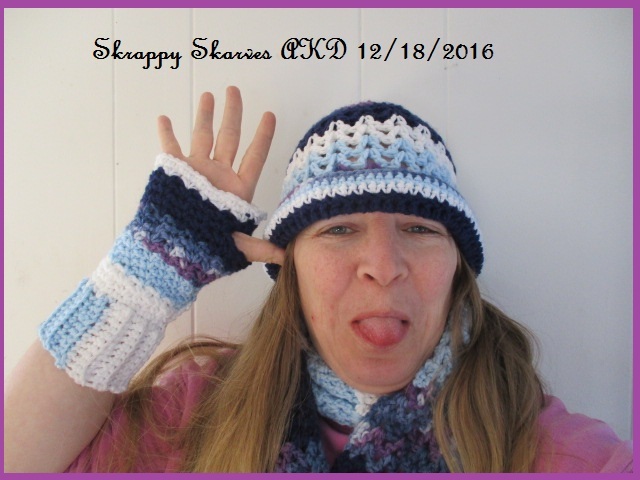 So here is the URL for a photo of me being silly modeling The Blueberry V-stitch Set. Wow, it did work! I am a blogging genius! I LOVE IT – now i’m gonna have to try it sometime Teacher! LMAO!!! !